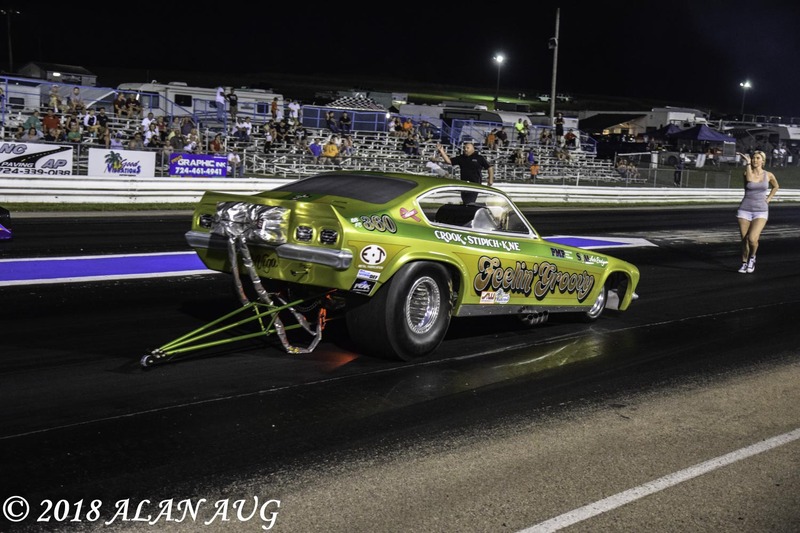 Keystone Raceway Park in New Alexandria, Pennsylvania played host to the 15th Annual Good Vibrations Nostalgia Funny Car Nationals on July 14th. 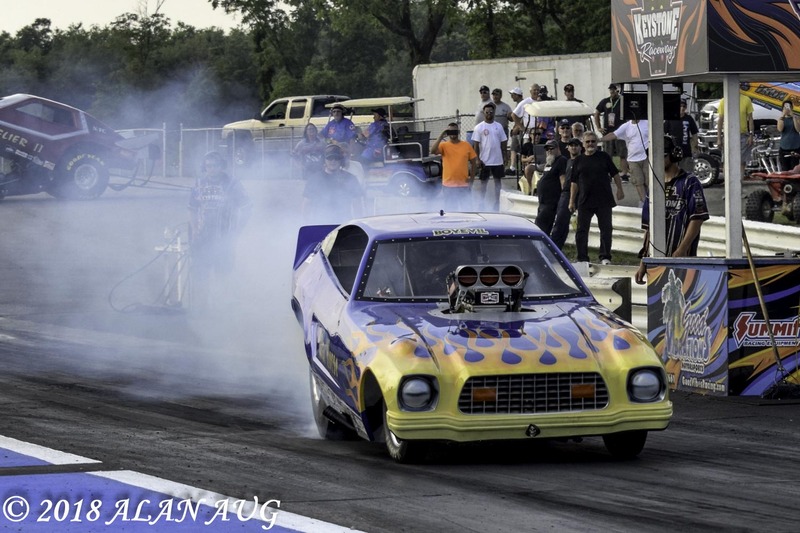 Twenty five injected and blown alcohol funny cars were in attendance. Hot and muggy weather did not lessen the enthusiasm of the competitors or the spectators. 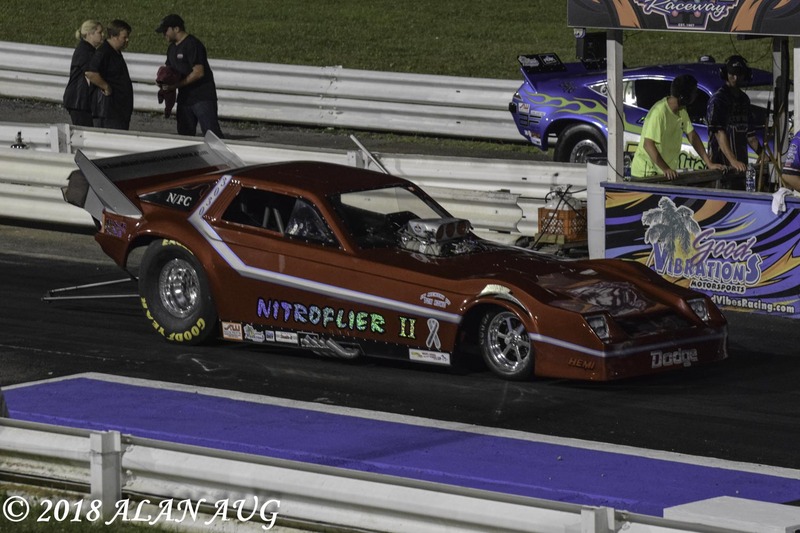 The beautiful “Brutus” Mustang under the lights. 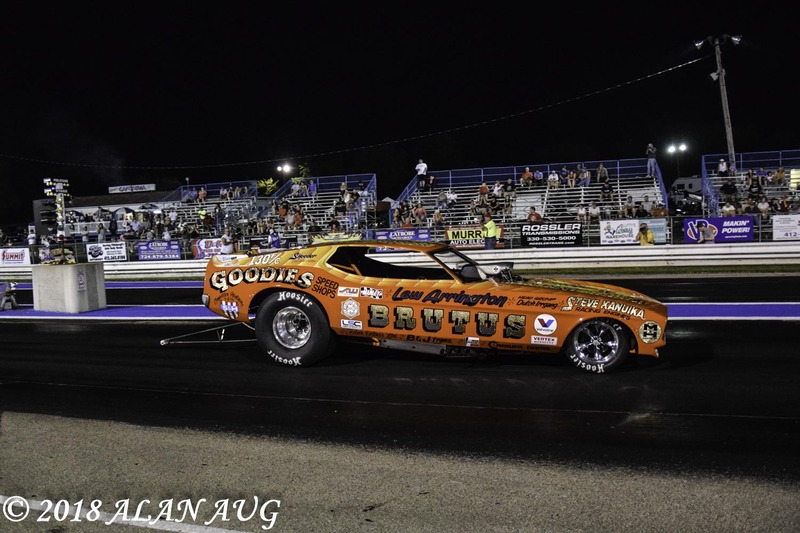 Dan McEwen brought his tribute to the late Tom McEwen’s early Barracuda funny car. 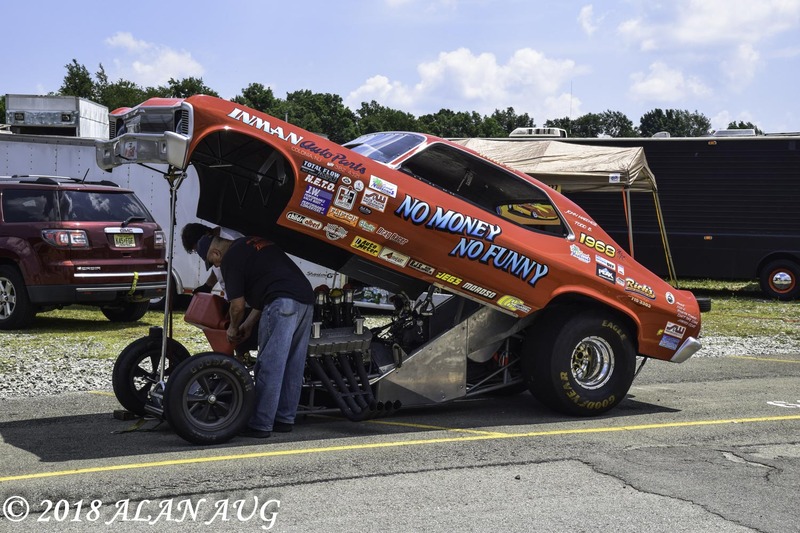 I hadn’t attended a funny car show of this magnitude since the good old days of National Speedway on Long Island in the 70s. 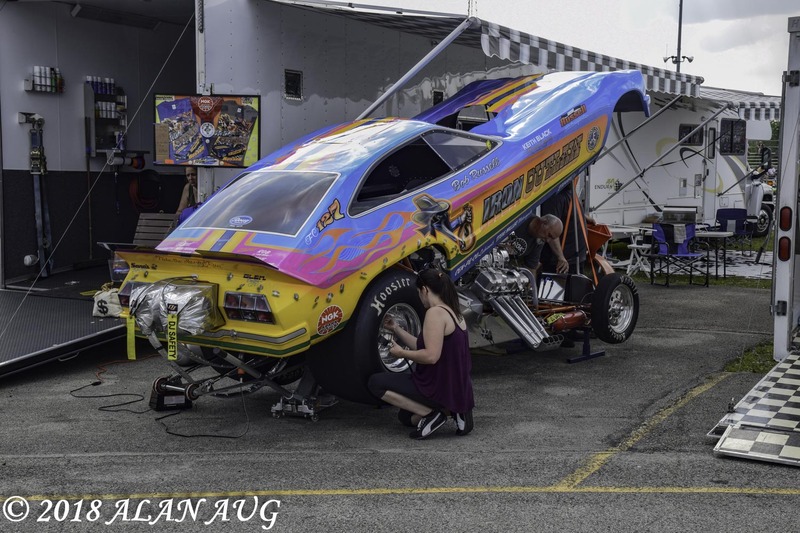 I was impressed by the cars and the hard work of the crews. 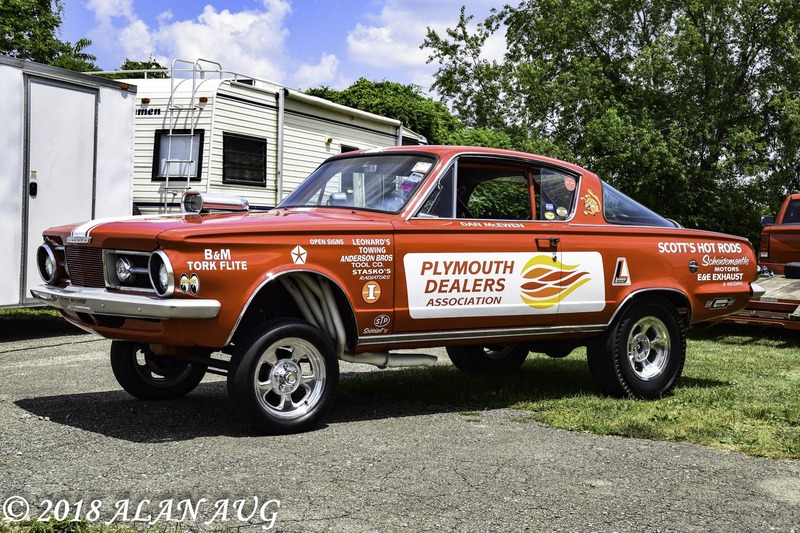 But I was even more impressed by the friendliness and hospitality as I roamed the pits with friend and noted drag racing photographer Ted Pappacena. The “Iron Outlaw” crews preps for competition. Willie Johnson pours the alcohol. This is my first attempt at “reporting” on an event so please forgive me if I’m short on stats. I was too engrossed on being this close to the action. It’s an amazing feeling as the cars go through their burnouts, dry hops and runs. The sound punches you in the chest as they go by. Another enjoyable aspect for me is variety of body styles that actually resemble production vehicles, unlike the generic shapes used in today’s pro class. Cars from the 60s to the 80s were represented. Veteran drag racing announcer Bret Kepner was on hand to keep the crowd up to speed on the goings on during the three rounds of competition. 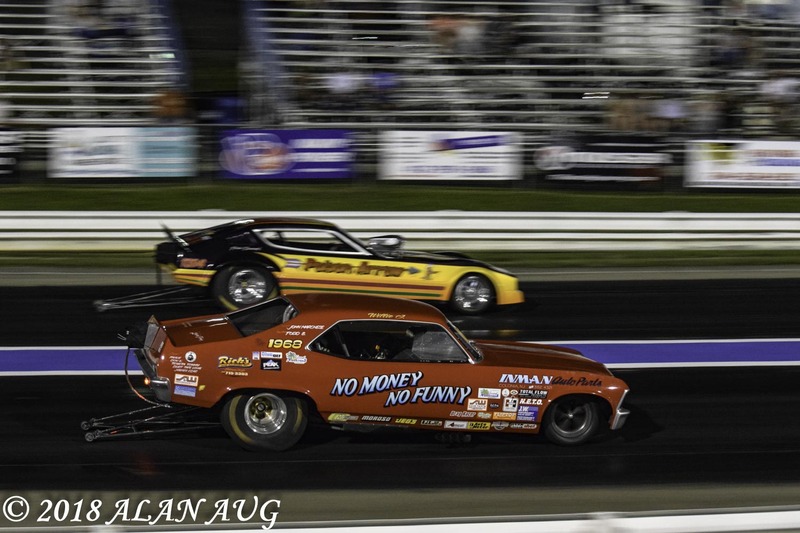 The finals came down to Frank Barnard’s “Poison Arrow” Plymouth taking the injected class win in a close one over Willie Johnson’s “No Money No Funny” Nova. 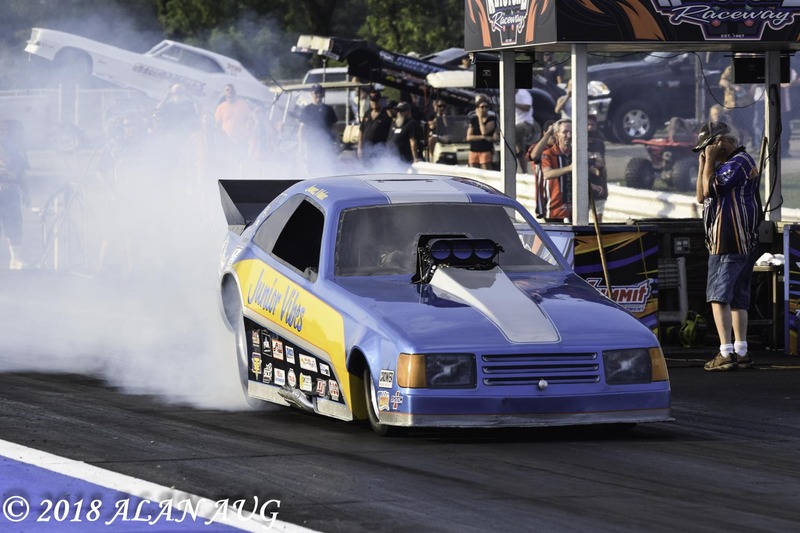 Chris Massarella’s “Total Insanity” Monza took the blown class final over Bill Wall’s “Nitroflier II” Dodge. After the racing action wrapped up , the crowd was treated to a spectacular fireworks display. 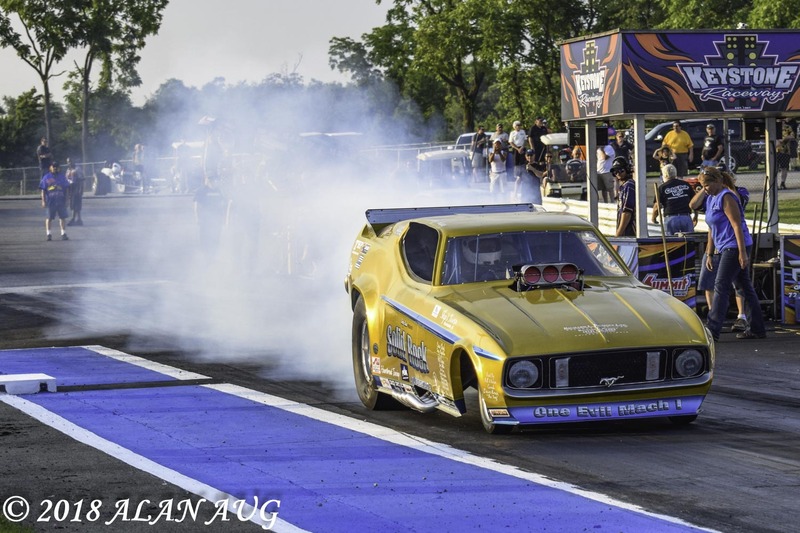 Frank Barnard edges Willie Johnson in the Injected final. Krista Massarella backs up husband Chris in the Blown finals. 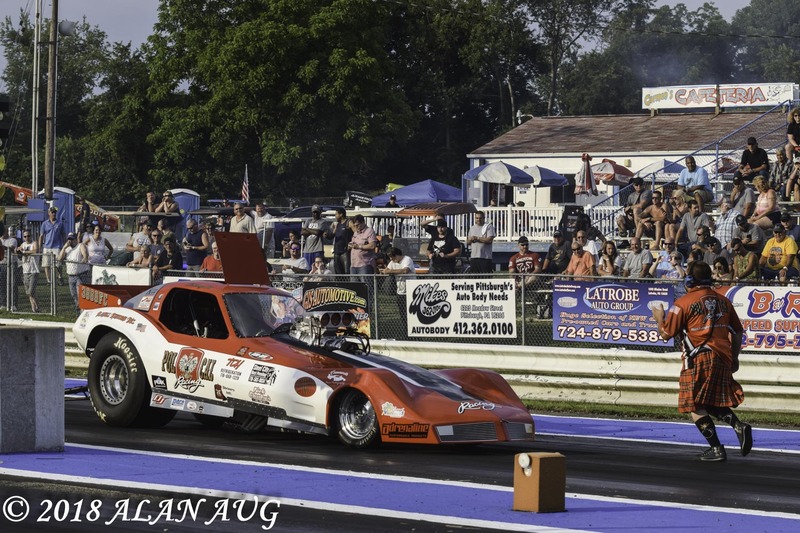 Bill Walls lines up against Chris Massarella in the Blown final. 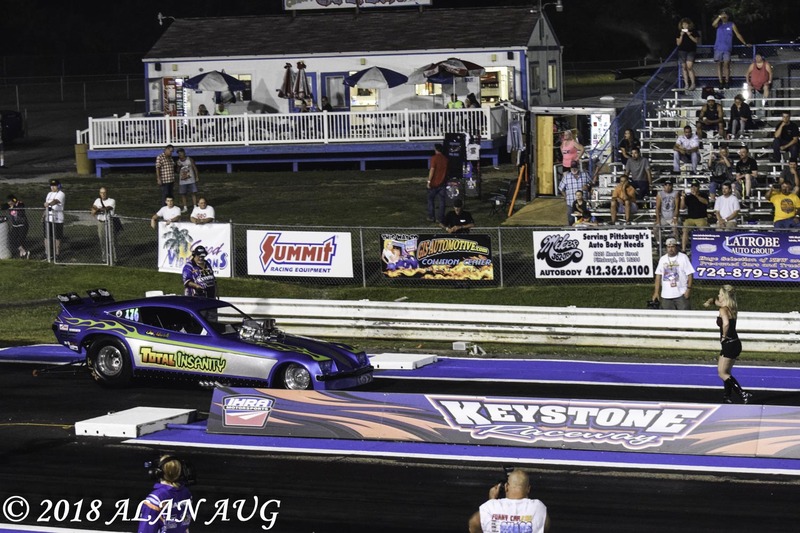 My hat’s off to the promoters and crew at Keystone Dragway and to the funny car drivers and crews for a most memorable weekend. I’m already looking forward to next year! James Maher heats them up in The “Junior Vibes” Tempo. 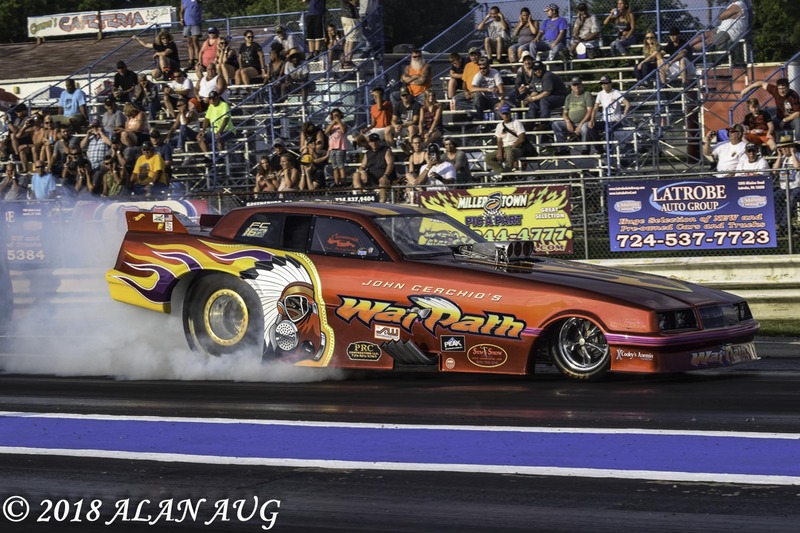 The “War Horse” gets angular during its burnout. 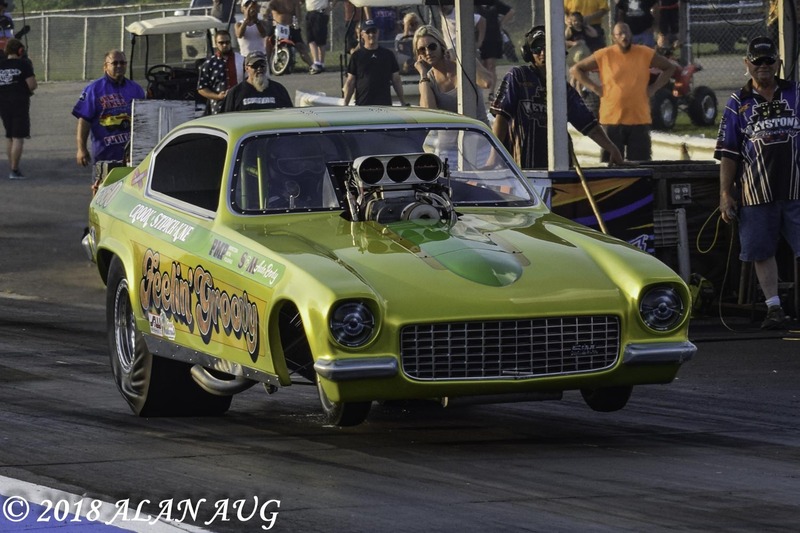 Steve Crook’s “Feelin’ Groovy” Vega. 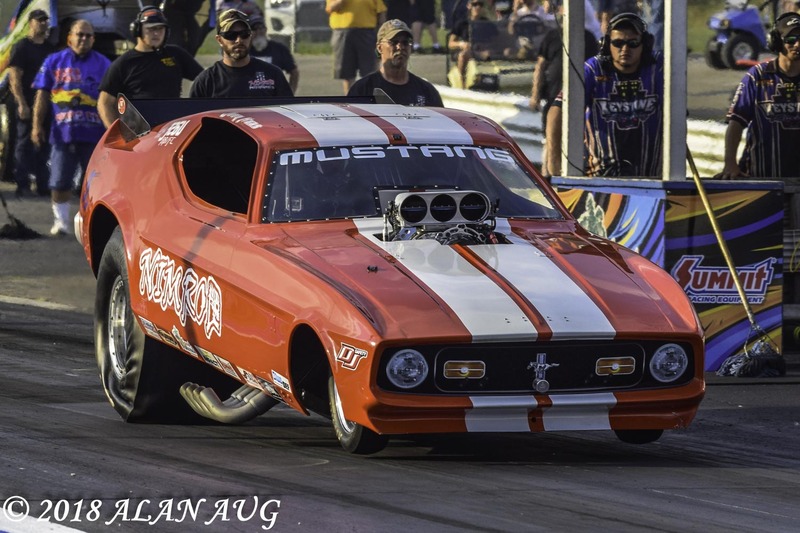 Rocky Ausec’s “Solid Rock” Mustang. 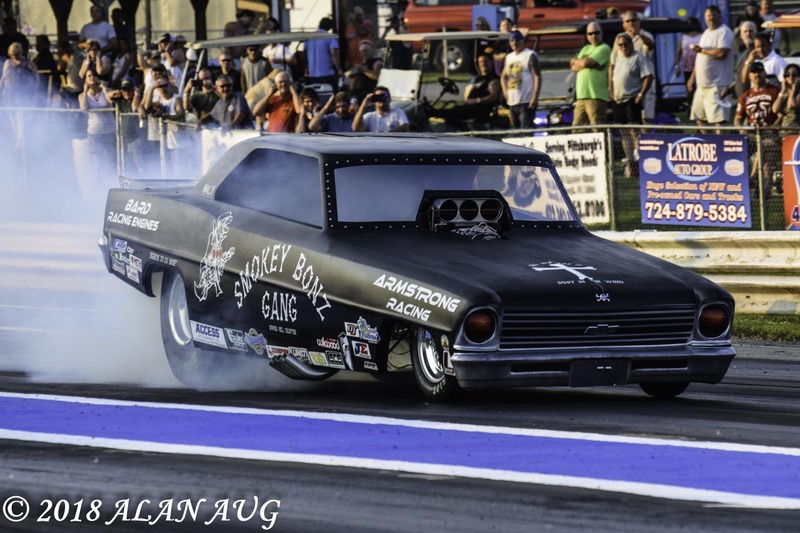 The “Smokey Bonz Gang” ups the nostalgia ante with their ’66 Nova. Don’t try to run. 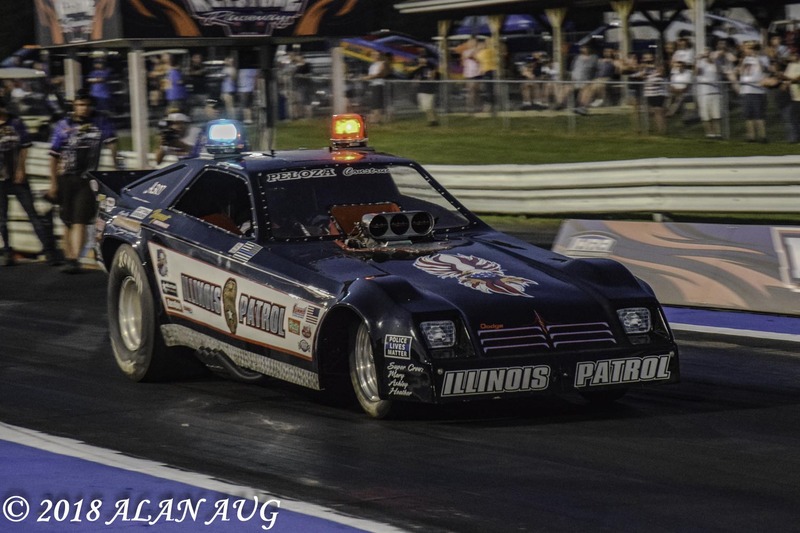 The “Illinois Patrol” will catch you! Steve Crook gets some help staying in the groove.